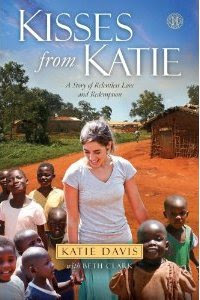 I’ve started reading Kisses from Katie lately and it is so inspiring. It falls right in line with many of the books I’ve read in the last few years: Don’t Waste Your Life by John Piper, Crazy Love by Francis Chan, Prisoners of Hope by Heather Mercer and Dayna Curry. All are worthy reads. "...But God continued to show me that adoption is His heart, and it was becoming mine. Adoption is wonderful and beautiful and the greatest blessing I have ever experienced. Adoption is also difficult and painful. Adoption is a beautiful picture of redemption. It is the Gospel in my living room." Ok, I started this post a few days ago. It’s now 1 am and I have to get up in 5 hours, but I can’t sleep until I finish this. These quotes are from the first fourth of the book. There is so much more, and I don’t just mean theology and philosophy. There are stories. Beautiful, amazing stories. How a girl in her young twenties can have such a grasp of theology and applying the truth of God’s Word is astonishing. God has taught her amazing things at an incredibly fast rate. And her connection between faith and works is incredibly encouraging. So here’s the bottom line: If you don’t read anything other (non-Bible) books this year, do yourself a favor and read this one. BUY it if you can. You will be glad you did!